JBL is on a roll of late. The company has launched a slew of new headphones over the past few months, including the new E-Series, which we’ve been reviewing model by model. The latest review we did is of the JBL E45BT on-ear headphones, but we’ve also looked at the E25BT in-ear headphones. Now, however, we’re looking at another pair of in-ears — the JBL E15 headphones. The JBL E15 headphones aren’t the only in-ears available from JBL, and they’re a little cheaper than the E25’s too — but are they still worth it? We put them to the test to find out. The JBL E15 headphones look very similar to the E25’s, though instead of the cable wrapping around your head, it simply snakes to your listening device — as these aren’t wireless. The unit we’re reviewing is white, though the headphones also come in black, blue, red, and green. By the looks of the phones on the website, the black headphones look the most sleek and stylish — but all the colors have a nice look. Part-way down the right side of the cable, you’ll find a simple single-button remote, which is used for playing and pausing. There aren’t any volume controls here — so you’ll need to use your phone or other listening device to control volume. As mentioned, the E15 and E25BT headphones look very similar — in fact, the in-ear units on the two headphones are basically identical. They’re relatively plain, but that’s not a bad thing — they look sleek and classy, and we like headphones that don’t add extra design flare just for the sake of it. Attention to detail is here as well — for example, the cable is a braided nylon rather than plastic, so it’s stronger, looks better, and won’t tangle as easily. In the box, you’ll find the headphones themselves, a small leather pouch, and a total of three ear tips, including the ones that come pre-installed on the headphones. In general, the JBL E15 headphones look good and are solidly built. Sure, they’re mostly built from plastic, but in this case we don’t mind the lack of metal. In-ear headphones often have a hard time being comfortable enough, but JBL has done relatively well in avoiding the issue. We wore them for a few hours at a time, and while towards the end of that they did get a little uncomfortable, they generally did better than most other in-ear headphones. That’s largely owed to the fact that they’re not overly large. 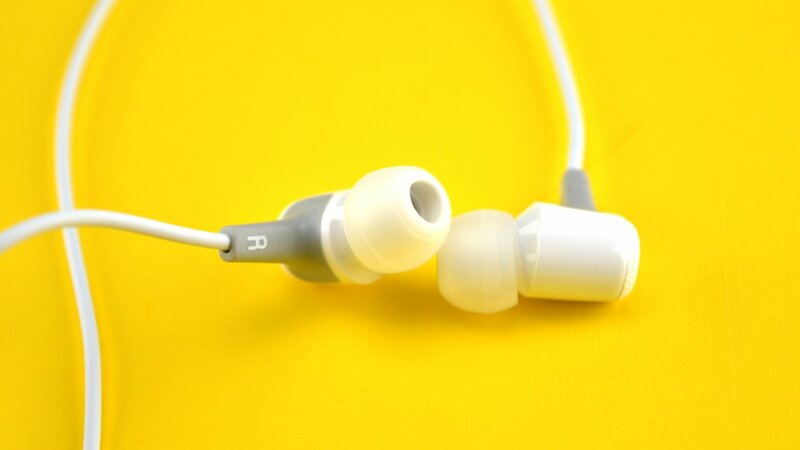 Some headphone makers built in-ear headphones that are bulky and heavy — but not JBL. We still had some issues with the headphones falling out. These aren’t billed specifically as sports-focused headphones, and if you do use them for running or sports, you may find them falling out often. For day-to-day use — like on the subway or bus — they’ll be fine, and shouldn’t fall out all that often. The JBL E15 headphones both look good and are relatively comfortable — but how do they sound? JBL has a history of delivering great-sounding headphones at a great price, and the JBL E15 headphones are no exception to that rule. Let’s start with the bass, which is relatively good-sounding. The headphones deliver quite a kick, and while bass is definitely the weaker frequency range here, it’s not overly so. Mega-bass fans should probably look elsewhere, but those into genres like rock, classical, and even some pop, will be fine with the level of bass on offer here. The mid-range of the headphones is quite pronounced. The low-mids are present, though not overly boosted. The high-mids, on the other hand, have been given quite a boost, and while it’s not to the point of the headphones sounding bad, we could definitely have used a little less in the high-mid region. Still, the boost does help in certain genres — it gives quite a bite to the guitars in AC/DC’s Back In Black, for example. The high-end is quite well-tuned, though we may have wanted a little more in the upper-highs to help give clarity to things like cymbals and other percussion. Still, the high-end is far better tuned than many other in-ear headphones in this price range. Overall, the JBL E15 headphones sound pretty good. Sure, they’re not perfect — but at this price range perfection is a little much to ask for. The JBL E15 headphones are an excellent offering, for the price. Sure, if you have a lot more than $40 to spend, these aren’t the headphones for you. But at this price, these are among the better options out there. There are some competitors — like the Fiio F3 headphones, which come in at only $25 — but nothing that really comes out ahead. Because of the high quality of the JBL E15 headphones, we’ve awarded the headphones the Headphone Review Bronze Medal.